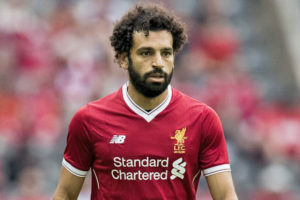 On Monday, Liverpool striker Mohamed Salah won undeniably BBC African Footballer of the Year Award beating four other contenders including club teammate Sadio Mané. Salah, 25, was voted online by BBC and football fans in his first appearance in the Award race. The Egyptian had a sublime year as he led the national side to the African Cup of Nations but failed to win the competition in the final match against Cameroon. The 25-year old pacey striker rose to stardom in his country after qualifying the Pharaons to their first World Cup since 1990. He netted the stoppage time penalty against Congo, which sent the Egyptian team to the world cup competition. He was handed the Award trophy at Liverpool Melwood training academy in presence of manager Jurgen Klopp. Salah was transferred from Roma, Serie A, after a short spell (2014-15) at Chelsea. He is the third Egyptian to win the award after Mohamed Barakat (2005) and Mohamed Aboutrika (2008). Salah takes over from Algerian and Leicester City star Riyad Mahrez.